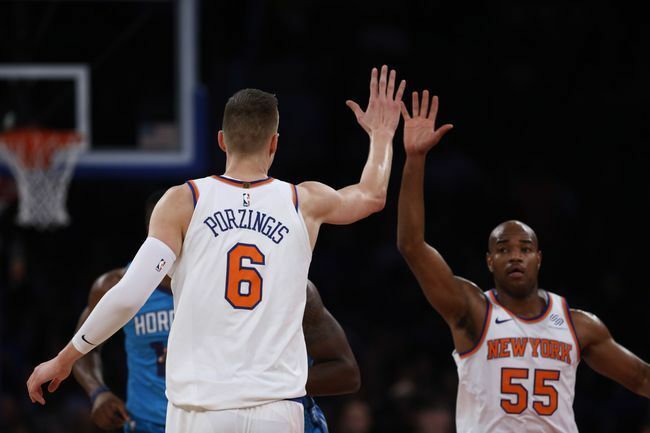 The New York Knicks had a chance to have a great week but they ended up blowing a big lead in the fourth quarter to prove that they are still young and very far from being a championship contender. The Knicks went 1-2 this week, but the morale is still pretty high around the team. The loss against the Magic last Wednesday was never an alarming signal since Kristaps Porzingis missed the game and the loss on Monday night was just an aberration. The Knicks were riding high into Orlando at 6-4 on the season and in a game that they could win. Porzingis’ injury played a big role in the loss and the Magic are just a better team right now. The Magic have had a surprise start to the season and are in the top half of the Eastern Conference so the Knicks could have beat them if they were fully healthy. They could have easily mailed the game in and blamed the loss on Porzingis, but the team gave effort for all four quarters and showed that they are not going to take games off even if all the cards are stacked against them. The Kings came to the Garden on Saturday night and so did Porzingis. He was great in that game and scored over thirty points once again to lead the Knicks in a blow out win. The Kings are a rebuilding team and the Knicks have to beat teams like the Kings at home if they want to be considered for a playoff spot. The game against the Kings was their easiest game in a while as the Knicks’ schedule starts getting really tough. The Knicks played the Cavs on Monday, and the Garden was rocking despite it being a Monday night. The crowd was into the game from the start and the Knicks jumped out to a big lead to make things even difficult for the Cavs. The Knicks players did not back down from the Cavs even when LeBron James got into an altercation with Enes Kanter and Frank Ntilikina. That altercation showed that this team is playing as a unit and has left their egos at the door. The Knicks have had issues with some of the players on the roster being too selfish in the past, that is certainly not the case this season. The Knicks could never put away the Cavs and eventually their shots started hitting and they came back and won the game thanks to the great shooting of Kyle Korver and the dagger three pointer over Porzingis by LeBron. Despite losing the game, the Knicks showed that they give effort and will not back down against anyone. LeBron had been trolling the Knicks all week whether it was saying that they should have drafted another player instead of Ntilikina or calling himself the “King of New York” on Instagram after the game, so it would have been great for the Knicks fans to win the game and shut him up. The Knicks are still far from being in the Playoff conversation but each week they are getting closer. The effort and the offense continues to carry this team and the defense has been getting better recently. The Knicks had a surprise start to the season thanks in large part to an easy schedule and they have played a lot of home games. The schedule gets tougher so it will be interesting to see how the Knicks react to the pressure. They play the Jazz at home, the Raptors in Toronto, and the Clippers at home this week. I think they will go 1-2 to go back to .500 on the season and very well could go 0-3. If the Knicks are able to win two of the three games this week, then they will be even closer to the Playoff conversation. The Knicks are not where they want to be, but if they continue at this pace, then they will get there sooner rather than later.